The western world unlike the middle east doesn’t have those little 3-4 days holidays sprayed throughout the year. There is an important break and this comes around the December period…. when business grinds to a halt and most companies take the month off. This was a very tough period for me personally and I ended up making a solo trip to the Adventure Capital of New Zealand – QUEENSTOWN. The city that has a permanent resident count of 15,000 swells up to 45,000 during the winter and summer seasons, though if you ask me it felt more like a half a million 😛 …. masses of people and not a parking spot to be found. The first day I drove into town, I found this abnormally long queue outside a dull brown cafe. That was odd…. there wasn’t a free meal in town was there? Once I settled in, curiosity took over and I decided to pay the place a visit. Turned out to be the “Fergburger” touted to be selling the best burgers in the country. I passed around the shop a couple of times, laughed at myself a couple of times and before I knew it, I was jotting it down on my Bucket List. Now the thing is, it isn’t so easy to just walk into the outlet and grab a meal. You have to earn it !!! and that I think adds to the sensory perceptions of the Burger. From the back end of the line, it takes about 45 minutes to the till and another 35 minutes waiting time on your order, but the end of the wait is a scrumptious burger. 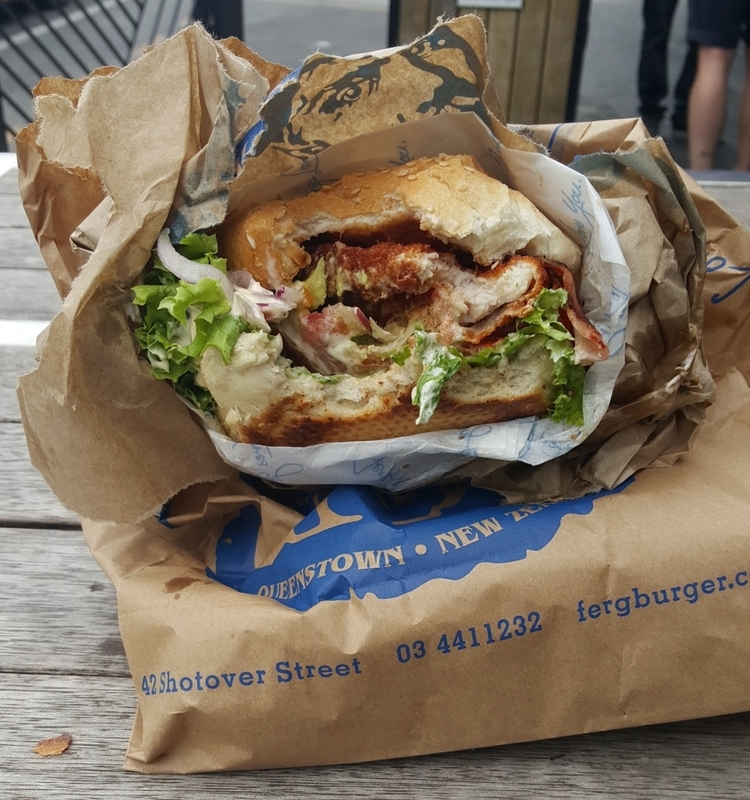 My verdict, the Burger is good…. better than most ones that I have had and its massive with a lot of fillings, worth the money spent, but the home made fries were a let down. Too salty for my liking, so a major let down. Nevertheless, an item ticked of my bucketlist.